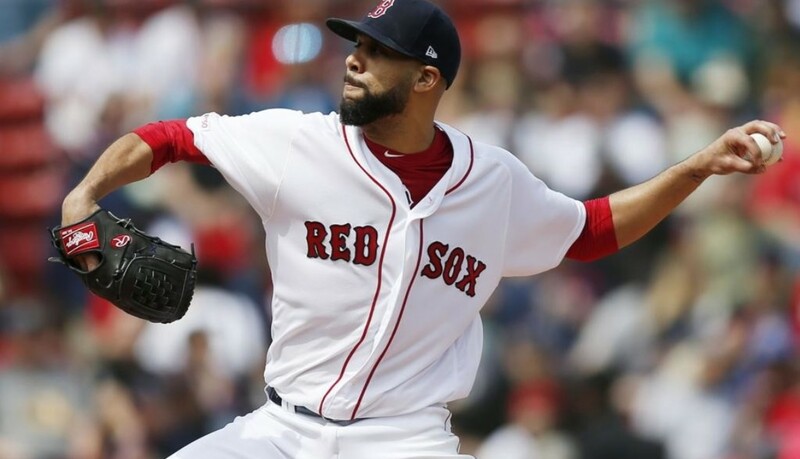 Red Sox 4, Orioles 0 : Priceless – David Price tosses 7 shutout innings & Xander Bogaerts drives in all 4 Boston runs, including a 3-run shot (#2) in the 8th as the Red Sox rebound to win @ home again. Chris Davis goes 0-4 w/ 2 strikeouts in the loss, a day after going 3-5 w/ 2 doubles & snapping an 0-54 streak. 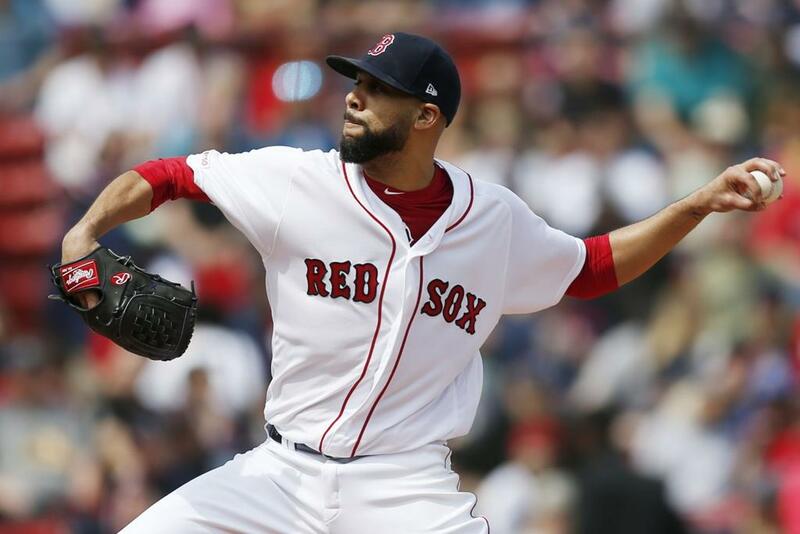 John Means allows just 1 run on 4 hits in 5 innings, but the Orioles bullpen allows 3 runs the rest of the way. 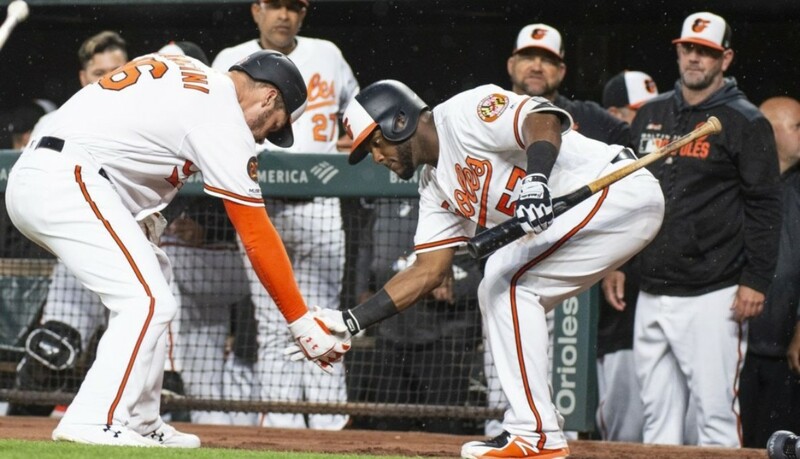 Baltimore has now allowed 33 HR’s, Including atleast 1 in each of their first 16 games & are 2-9 since starting 4-1. 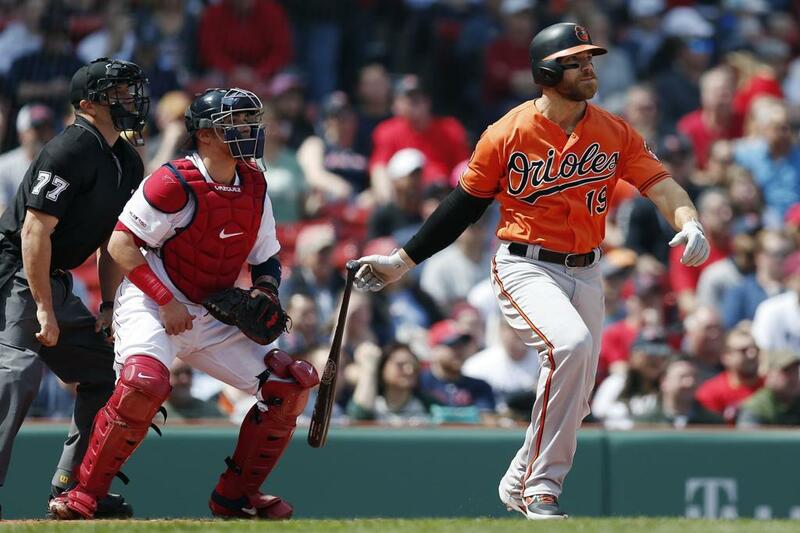 Orioles 9, Red Sox 5 : For The Record – Chris Davis ends the longest hitless drought in MLB history – 0-54 dating back to last season in a big way as he has 3 hits, including 2 doubles & drives in 4 runs & the Orioles beat the Red Sox @ Fenway to even the series. Renato Nunez & Rio Ruiz each have 2 hits & drive in 2 runs, Nunez also scores twice for the O’s as well & Andrew Cashner pitches 5 innings for the win. Christian Vasquez homers (#2) & drives in 4 runs for Boston. 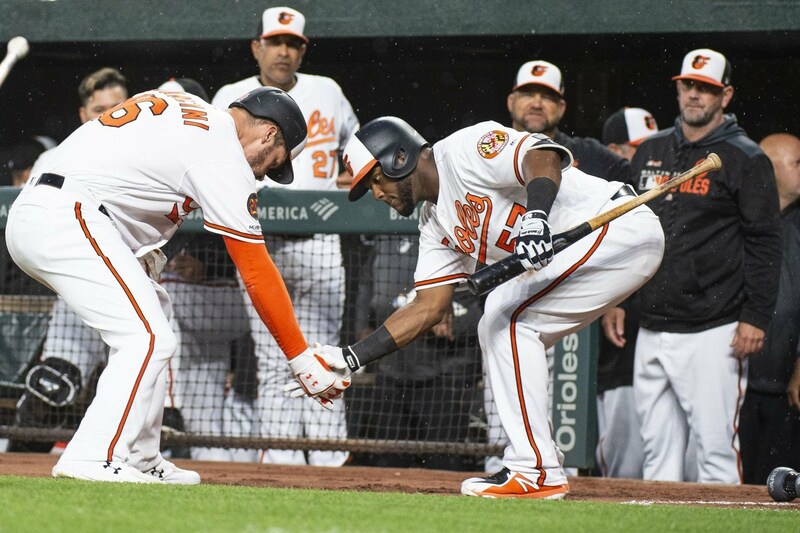 Baltimore has now allowed at least 1 HR in each of thier 14 games played this season & has allowed 34 on the season. Game 3 was today from Fenway. 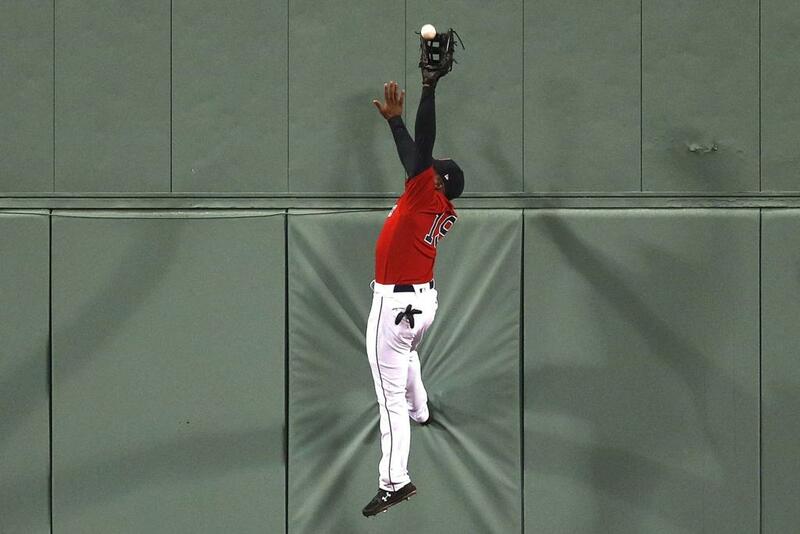 Red Sox 6, Orioles 4 : Jumping Jackie Flash – Jackie Bradley Jr. makes 2 huge catches in the outfield, 1 to shut down an 8th inning rally by the O’s & drives in a run on a sacfly as Boston takes game 1 @ home. Andrew Benintendi homers (#1) & Eduardo Nunez has 2 hits & drives in 2 as the struggling Red Sox win back to back games for the 1st time this season. Dwight Smith Jr. (#2) & Renato Nunez (#2) both homer for the O’s in the loss. Baltimore has now lost 7 of 8 since starting 4-1. Game 2 was today. 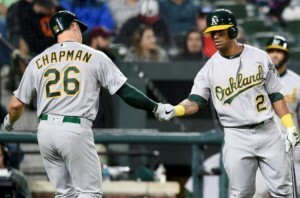 Athletics 8, Orioles 5 : False Identity – Khris Davis homers twice (#8 & #9) for the 2nd straight game & the A’s homer 5 more times as a team as they take 3 out of 4 from the O’s @ home. Josh Phegley (#3), Kendrys Morales (#1) & Marcus Semien (#3) also homer for Oakland, the Orioles have now allowed a MLB high 32 HR’s already this year. 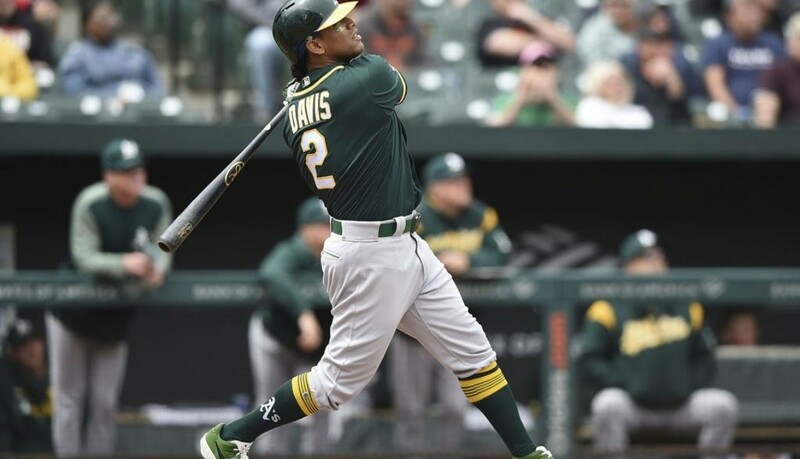 Dwight Smith homers for the O’s (#1) & the other Chris Davis goes 0-3 to bring his mark to 0-32 this season & 0 for his last 53 dating back to last year. Baltimore goes 1-6 on their homestead & allows 28 homeruns in that stretch. They now head to Boston for 4 over the weekend. 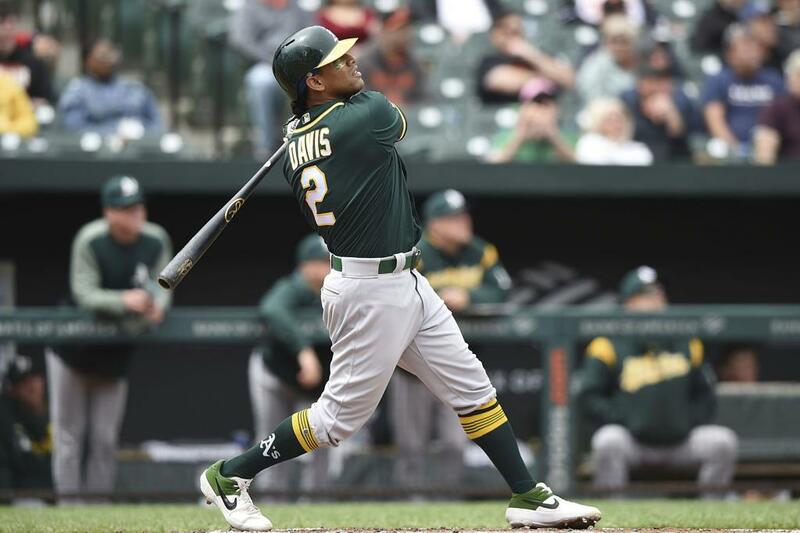 Athletics 10, Orioles 3 : Playing Powerball – Khris Davis homers twice (#6 & #7) & drives in 4 runs & the A’s homer 5 times as a team to rout the O’s @ home again. 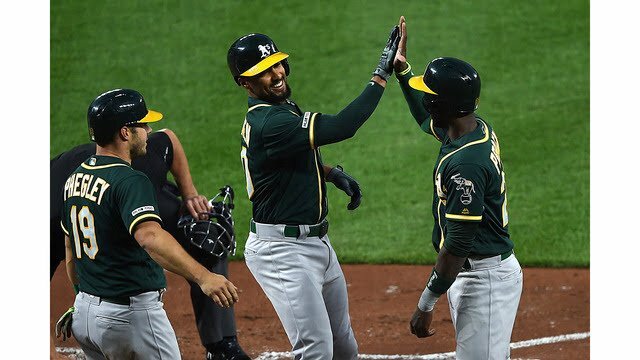 Jurickson Profar (#2), Brandon Pinder (#3) & Matt Chapman (#4) each add homers for Oakland as well. The Orioles pitching staff has allowed 27 HR’s through just 12 games, the most in the majors. Rio Ruiz (#1) & Trey Mancini homer (#6) & Chris Davis extends his hitless streak to 50 at bats for Baltimore. Game 4 was today. Athletics 13, Orioles 2 : Athleticism – Jurickson Profar has 4 hits, including a HR (#1), drives in a career high 5 runs & Marcus Semien hits a 3-run shot (#2) & drives in 4 for the A’s as they rout the O’s @ Camden Yards. Josh Phegley has 2 hits, drives in 1 & scores once & Brett Anderson pitches into the 7th inning to pick up his 3rd win. Oakland wins on the road for the first time in 5 tries so far this season. Chris Davis sat this one out for Baltimore as his struggles continue. Game 3 is tonight. 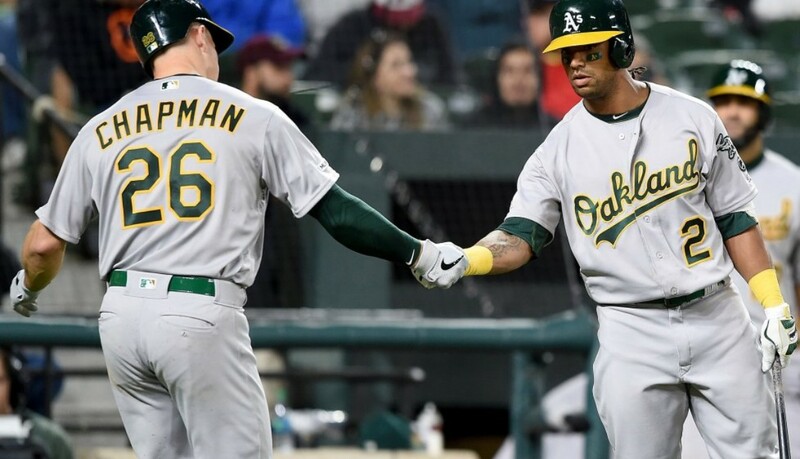 Orioles 12, Athletics 4 : Birds Of A Feather – Jonathan Villar homers (#3) has 2 hits & drives in 4 runs, Cedric Mullins triples twice & drives in another 3 & Trey Mancini goes 3-3 including a homer (#5) & drives in 2, as the O’s blow out the A’s @ home. 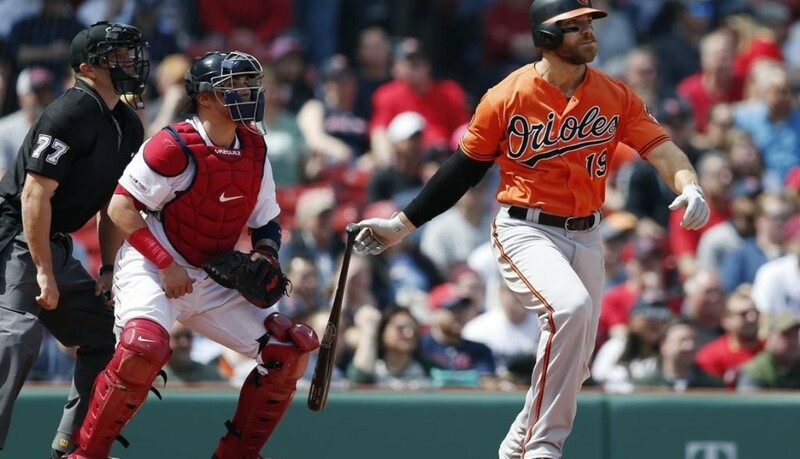 Chris Davis goes 0-5 to set a major league record for futilty as he is now 0-28 this year & 0-for his last 49 since doubling last September 14th. Baltimore snaps a 4 game losing streak & will look to keep it going tonight. Yankees 15, Orioles 3 : Scary Gary – Gary Sanchez homers 3 times (#4, #5, #6) drives in 6 runs & the Yankees homer 7 times as a team @ Camden Yards to pull off the sweep of the O’s on the road. 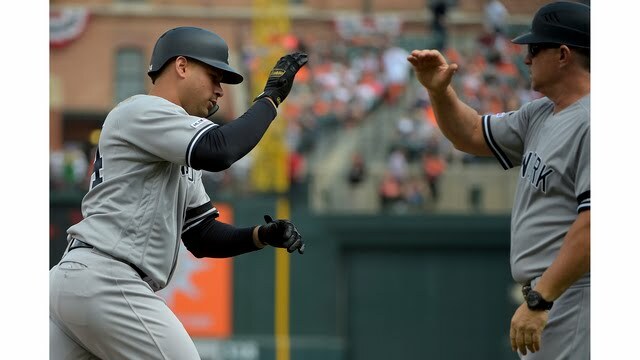 Sanchez hits 2-run homers in the 3rd, 7th & 8th innings to put the game away. David Hess allows 4 runs on 5 hits in 5 innings after IF Hanser Alberto made the start for the O’s. Gleyber Torres (#3), Clint Frazier (#2 & #3) & Austin Romine (#1) all homer for New York in the rout. Baltimore gets swept, has lost 4 in a row & will now host Oakland for 4 starting today. Yankees 6, Orioles 4 : I’ll Be The Judge – Aaron Judge homers twice (#1 & #2) both off of O’s starter Dylan Bundy & drives in 3 runs as the Yankees win in Baltimore again & take the series. 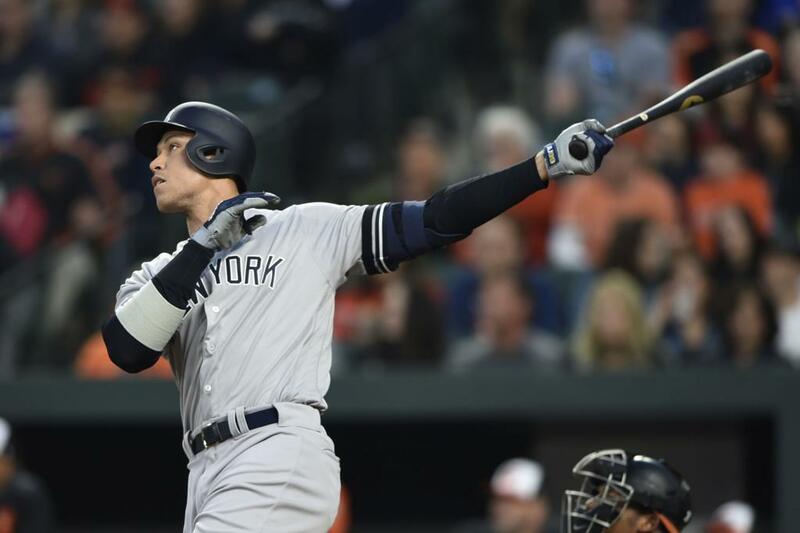 Clint Frazier hits a 3-run shot (#1) in the 8th off of Miguel Castro to put the Yankees ahead late & Aroldis Chapman closes it out in the 9th. The Yankees have won 7 straight @ Camden Yards & have homered in 13 games in a row there. Trey Mancini homers (#4) for Baltimore in the loss. Game 3 was today as New York looks to go for the sweep. 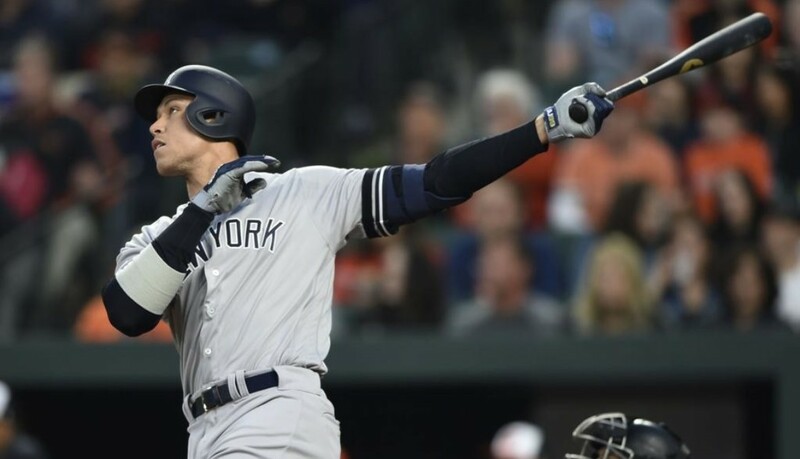 Yankees 8, Orioles 4 : Home Wreckers – Gleyber Torres homers twice (#1 & #2), racks up a career high 4 hits & drives in 4 runs as Yankees spoil the O’s home opener. The Yankees rally against reliever Mike Wright, who allows 3 runs on 4 hits in the 6th for Baltimore. Gary Sanchez (#3) & Luke Voit (#2) also homer for New York. Jonathan Villar homers (#2) for the O’s & Renato Nunez has 2 hits, drives in a run & scores twice. 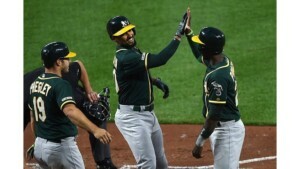 Both teams had today off before resuming the series on Saturday.